halfbean wrote: I sent 17 of my steers and a few heifers last fall to Graham's in Gonzales to be fed after I weaned them. They were 1/4 to 1/2 Brahman. Got the results back last month and they graded out 73% choice with the remainder being select. We use a 44 farms Angus bull and a polled Hereford crossed on the Brahmans. I thought that was pretty respectable. Graham's specializes in feeding Brahman influenced cattle. Not only is it respectable but it's typical of the polled Hereford, Angus, Brahman mix. The DM conversion on them was 6.08, they gained 3.08 lbs/day and the cost of gain was .74 cents per pound. And that includes a few heifers in the group. I figured I cleared over $400/hd extra feeding them out. That's better than taking them to sale barn and being told the buyers don't want calves with ear. Brute 23 wrote: I'm not saying every one should use F1s or even Brangus. If you can put even 3/16 Brahman blood in your Angus cows you could benefit. When you go back with an Angus bull again the buyers will never know. UltraBlacks sounds like a good alternative for cold climates. I couldn't remember what they called them. I had one. It was supposed to be less Brahman than Brangus. Thought they called it Angus Plus or some thing? Yup it's Angus Plus, basically Angus Plus and Ultrablack are almost same animal. They have better cold tolerance than most Brahman composites. We have few people that raises Brahman influenced cattle in Minnesota but they're high maintenance animals with high inputs than the Angus & Hereford. Muddy is the world's foremost exert on Bos indicus, Brute. Time for all of us to shut up and learn from his wisdom. Why is it that nobody on the Gulf Coast lectures Muddy about the grain states but Muddy is overflowing with free advice for us? May I suggest that Muddy learn Portugese so he can also enlighten the Brazilians? Certainly it must be distressing to him that so many head of cattle are raised without his experience in Wisconsin and Minnesota? Don't pess down my back and tell me it's raining! JWBrahman wrote: Muddy is the world's foremost exert on Bos indicus, Brute. Time for all of us to shut up and learn from his wisdom. I don't see that he said on word about Brahman cattle in gulf states. Quite the opposite actually. Show me where Muddy said a negative word about hump back cattle on the gulf coast and I'll think about going to the movies with you. The Ultrablacks are just Brangus crossed back with Angus, so the result is 3/16 Brahman influence and 13/16 Angus. Rafter S wrote: The Ultrablacks are just Brangus crossed back with Angus, so the result is 3/16 Brahman influence and 13/16 Angus. That's a cross even I could learn to love. I said that on page 4 TT? Posted a pic of one and every thing. I think in the next 5-10 years you are going to see a huge shift in the opinions of people on Brahman cattle. The associations are spending a lot of money to prove they will grade and adapt the breed if necessary. I don't care what the breed is... if you line up continental cattle... the black cattle will not tolerate the heat like the reds, and the reds will not take the heat like the whites. That's first hand also. I'm trying to head completely away from black cattle unless they are terminal. If I decide to put an Angus bull across our Brahman cattle it will be a red angus. Which question? No, i don't and won't put a floppy eared bull over our cows. The hit at the sale barn would be disastrous and my market for Bulls and replacement heifers would be ruined as well. I'm glad they work for you though. So, again, some thing you have never tried. 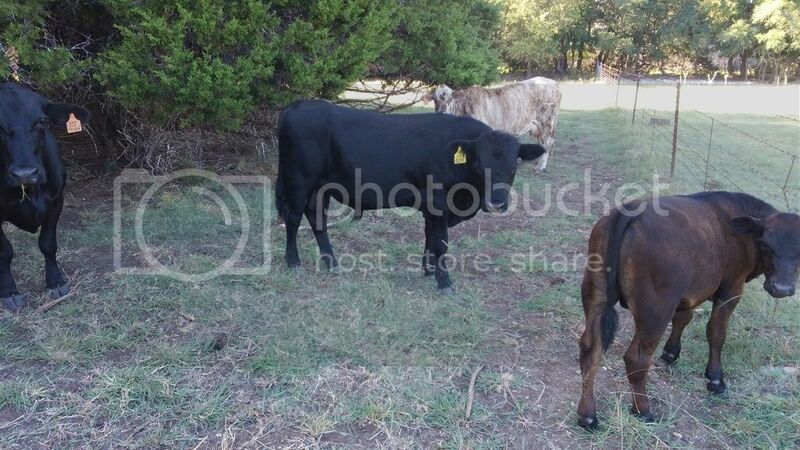 I have put an Angus bull over Brangus cows, then kept the heifers for cows, and bred them back to an Angus bull again. I could line the calves up at any Angus sale and no one would know. Here is a 3/16 Brahman heifer... Brangus mom... Angus dad. I bred her to a Hereford Bull and she has a nice black mot at her side right now. By cracky there it is! Good plan.